Do you ever dread the colder seasons because of the havoc it wreaks on your skin? Do you find yourself looking for THE best lotion to take away your ashy skin? If you answered yes to either of these questions then you are in for a treat. You know I love a good skincare product and I always tell it like it is. I got to try Dermae Anti-Wrinkle Vitamin A Creme and was pleasantly surprised with my results. I have what I call hybrid skin. My face is usually very oily. This is not a bad thing because I am sure I will age less noticeable than some. My chest and torso are normal, meaning I don’t usually need to moisturize them. My arms, legs, back, and feet need some TLC in the moisture area. I tend to notice this more in the colder months. I can actually SEE the dryness in my skin. My hands probably suffer the most and is where I need extra TLC. I normally use a brand from the drugstore shelf and can usually see decent results. 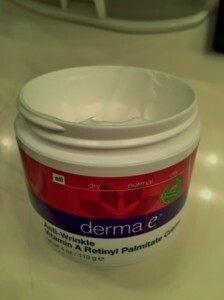 As soon as I opened my jar of Dermae Anti-Wrinkle Vitamin A Creme I doubted it was going to work on my thirsty skin. The formula is very light and fluffy. I thought there is no way this will penetrate my skin and give me lasting moisture. I applied it to my feet first because I always test on my toughest spot. I slathered it on like there was no tomorrow. Bad idea! In this case, a little goes a long way. I had enough to slather on my whole leg and thigh. I continued by massaging it into my heels. I applied socks like I usually do and went on with my day. Now normally I would need to apply again before bed to keep my feet soft but I felt my heels and they didn’t need another application. I do have a love/hate relationship with my feet so I do apply moisturizer to them daily. I really want baby soft feet! Dermae Anti-Wrinkle Vitamin A Creme doesn’t make them baby soft but it certainly makes a difference. I wanted to be able to really see a before and after difference so I applied the creme to one of my hands while using another brand on my hands. I can’t say that it reduced wrinkles on my hand but it was so much softer than the other hand. It looked and felt smooth and supple. There are many reasons you should use Dermae Anti-Wrinkle Vitamin A Creme but I will highlight the reason I will continue to use it. Cruelty, Gluten, and GMO free-means it’s good for you and our friends on the planet. 100% Vegan-means our healthy friends can use it too! Contains 100gms Vitamin A-means it encourages cell renewal in order to keep your skin looking young. You can use it on your whole body, even your face-means less $ to spend on other creams! You can purchase at most Walgreen’s for about $12-speaks for itself. I would recommend this creme for anyone wanting youthful looking, moisturized skin. You can purchase at your local Walgreen’s Be sure to stop here and grab a coupon first. ***Thank you to Brand Backer for providing this product for my opinion. All opinions are mine.